Ask fellow campers about "Mari-Osa-Delta" and nearby attractions. Big rig friendly with level sites but campground was hilly. Road into and inside campground needed work. Site had a good view of river. Showers were clean but old. Did not use laundry. No cable but no problem using our satellite. Wifi was weak but worked most of the time. No dog park but could walk dog on dead end road leaving campground. We camped at Mari-Osa-Delta in a Travel Trailer. Easy access to I50 to Walmart (10 minutes) and Jefferson City (20 minutes). Capital was very pretty with shopping and restaurants. 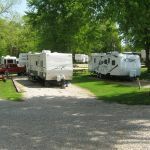 Great small campground!! They even have a cafe with excellent food & drink, with terrific conversations!! Very clean. 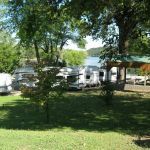 Our camp site had a full view of the Osage River. 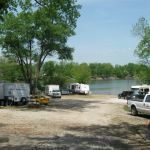 The campground is directly located by river!! We camped at Mari-Osa-Delta in a Travel Trailer. Are you affiliated with Mari-Osa-Delta ?